Val Kosh is a Cheshire artist. Born in Staffordshire, she studied fine art at Stoke-on-Trent School of Art and Trent Park College at Middlesex University. She gained a Master of Art Education from Liverpool University. She worked in art education for a number of years and was a senior lecturer and programme leader in the Fine Art Department of The University of Chester where she taught on undergraduate and postgraduate programmes. She left education to paint in Italy where she lived for a number of years. Here the beautiful Italian landscape became the inspiration for her painting. She returned to live in Cheshire and is finding renewed inspiration from the British landscape. 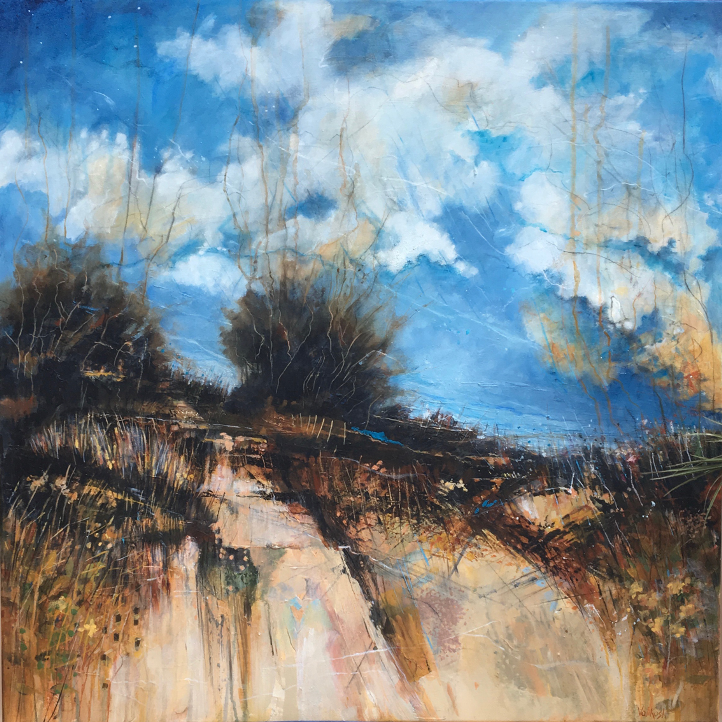 The latest body of work is inspired by the Sandstone Trail, which runs across Cheshire. Much of the Trail is elevated and offers spectacular views right across the Cheshire plain to the Mersey and Liverpool, and to Wales and the Pennines. Val is drawn to this area, to its woodland and hedgerows, moor-land and ancient heathlands, deep ridges and sandstone escarpments, birds flying out of low trees, sudden viewpoints and big blustering Cheshire skies. She is interested in responding to the atmosphere and experience of the Sandstone Trail, rather than making representational images of it. Through building, layering and working into the paint surface she wants the resultant image to express a sense of being there. Throughout her career Val has continued to make her own work. Having exhibited widely both nationally and internationally in Europe, the USA and Hong Kong, her works are held in many private collections.